Review: 4001 A.D. (Valiant Comics) – W.A.R.G. As Lulu continues to fight the good fight while her section of New Japan is set for demolition and her parents beg her to turn herself in, Rai is still alive, trapped on Earth. With the aid of two companions and a mech-like ship the trio ventures back to the orbiting nation for a final confrontation with Father. There is quite a bit that goes on in 4001 A.D. and at a very high pace. The few issues that the collection is comprised of tells a very compressed tale that flashes by in colorful art. It isn’t very intricate, the story, a science-fiction version of a trope we have heard before, but that in no way makes it dull. The context and society that has spawned it makes for very interesting social commentary. Father numbs the people of New Japan with entertainment, which makes them uninterested in the world around them, very much like the unnamed government in 1987’s Running Man. What Father’s motives actually are remain unanswered as such, but a misguided love, like the one Stalin might have had towards the Russians. He and Rai seem to be fighting towards the same end goal, but with a very different view of one best reaches it. Rai, who like the monster in Frankenstein has been created by a mad entity, becomes confronted by humanity and love and that is what shapes him, that is what causes him to rebel and in turn inspires others to join the fight. There is much to be discussed between the pages of 4001 A.D.; friendship, loyalty, love and parenthood and as a reader one wishes, when it is all said and done, that there had been more, more to sink your teeth into. As with most Valiant titles the artwork is beautiful, filled with vibrant imagery and intense colors. It moves the story along and hints at a bigger picture and a wider world. It makes the entire 4001 A.D. world more mysterious and interesting and even though the four issues only treat a small portion of the story, a quick glance of a greater whole, it becomes exciting and furious. 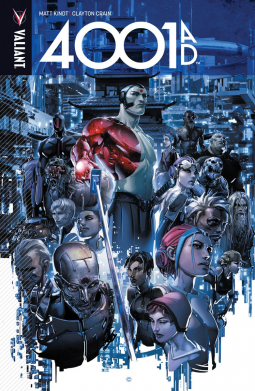 All in all, a book like 4001 A.D. really shows the strengths of Valiant as a publisher and universe.